Harold Holt became Australia's 17th prime minister when Robert Menzies retired from Parliament in January 1966. Harold Holt had ambitions, but they were more for the country than for himself. He considered that Australia needed to become more independent in policy and practice, including in relation to Britain. He took pride in 'not stepping over anyone's dead body' to ascend to the position of prime minister. Holt began work as a solicitor, but was urged by a number of acquaintances including Menzies to run for parliament, and stood for the United Australia Party (UAP) against James Scullin in the seat of Yarra in 1934. The loss was only a temporary setback, with Holt entering parliament in 1935, at just 27 years of age. In 1940 Holt enlisted in the Australian Imperial Force as a gunner, with parliamentarians receiving military pay in addition to their parliamentary allowance and being given a 'pair' during parliamentary divisions. Later in 1940 he was recalled to the ministry by Menzies, following the death of three ministers in an air crash in August that year. Holt served patiently as Deputy Leader for a decade, before being elected unopposed to the leadership of the Liberal Party just a few hours after Menzies announced his retirement in 1966. Despite a significant parliamentary career spanning more than three decades, Holt is often remembered for his tragic drowning off the Victorian coast. Responses to his death included a plaque on the rock floor of Cheviot Beach and the naming of a U.S Navy warship, and a Melbourne swimming pool, in his honour. The Holt ministry includes Senator Annabelle Rankin as Minister for Housing. She is the first Australian woman to administer a federal government department. On 14 February 1966 decimal currency is introduced in Australia. Discussions in Australia about a decimal currency had started as early as 1901. On 8 March 1966 it is announced that the Australian battalion in South Vietnam will be replaced by a larger task force under Australian command, consisting of 4500 men. In March 1966 the Holt Government introduces significant changes to the White Australia policy, lowering the requirements for non-European entry, residency and citizenship. On 12 September 1966 Australia enters into an agreement with the United States for the establishment of a joint defence space research facility at Pine Gap in the Northern Territory. In the Commonwealth referendum on 27 May 1967 more than 90 per cent of Australians voted 'Yes' to removing two references in the Australian Constitution which discriminated against Aboriginal people. This meant that the Federal Government could make laws relating to Aboriginal people and also that they would be counted in the census. References to 'British' were removed from Australian passports in August 1967 and 'British subjects' was taken out of the Nationality and Citizenship Act. On 2 November 1967 the Council for Aboriginal Affairs is established. It was to advise on the formation of national Aboriginal policy and provide linkages between the states and relevant Commonwealth departments. The first Australian satellite WRE SAT 1 is launched from Woomera in South Australia on 17 November 1967. Australia is only the third country to launch a satellite from its own territory. The satellite carried out scientific tests measuring the composition of the atmosphere and solar radiation. Holt was committed to his parliamentary duties to the point of 'slavishness', with substantial experience of the requirements of managing parliamentary business gained from a decade as the Leader of the Government in the House of Representatives. The Holt Government's election victory in November 1966 greatly reduced the number of Labor parliamentarians, and Arthur Calwell's retirement brought Gough Whitlam to the leadership. Holt was under pressure, within his party and beyond, to step up and perform well in Parliament by comparison with the new Opposition Leader. The half-Senate election on 26 November 1967 was expected to extend the 1966 election success, instead the government lost control of the Senate. Throughout 1967, Holt faced significant pressure in Parliament over lengthy, unresolved issues including allegations about misuse of Royal Australian Air Force VIP flights, which centred on the extent to which passenger lists for these flights were available. 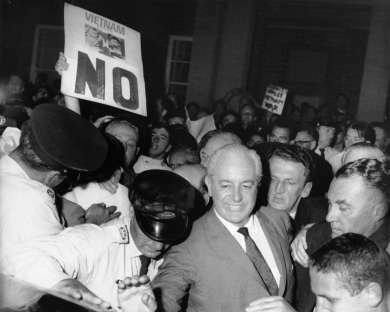 The 1966 federal election held ten months after Holt became prime minister was dominated by the issue of Australia's commitment to the Vietnam War. The commitment was denounced by the Labor leader Arthur Calwell, establishing Labor as the anti-war party. The Australian public confirmed their support of the action taken by the Holt Government, with the Coalition returning with a majority of 41 seats. Holt now had a very large and ambitious backbench, but did not take the opportunity for significant renewal in Cabinet. Holt did not have the authority of Menzies and was considered by some colleagues to be too loyal and nice. With party mavericks, he appealed to their sense of fair play, rather than taking tougher action against them. Holt experienced a revolt by a number of backbenchers, over what they viewed as the inadequacy of the Spicer Royal Commission into the HMAS Voyager disaster. Holt bowed to the pressure and announced a second royal commission, without consulting his Attorney-General or his Cabinet. During his visit to the United States in June 1966, Holt formed a close personal relationship with U.S. President Lyndon Johnson. In a speech at the White House, Holt departed from the prepared text and enthusiastically declared that Australia will be ’all the way with LBJ’ in relation to the Vietnam War. The remark created a furore in Australia, where it was variously described as servile, cringe-worthy and trivial. Holt was surprised by the reaction to the comment and stated that it ‘doesn’t mean, certainly, that Australia has any lack of independence of mind…’ On hearing of the criticism, Johnson sent Holt a personal letter of support. 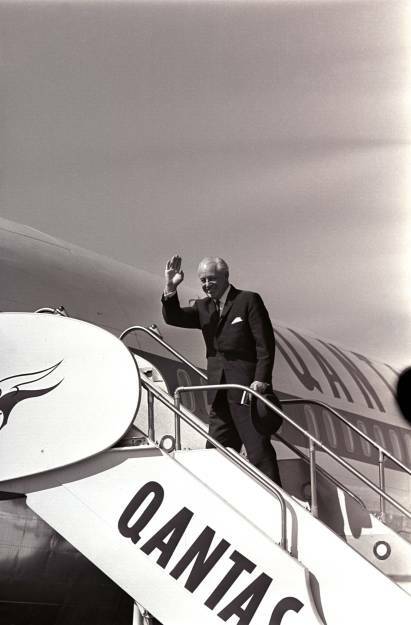 In October 1966, in the lead-up to the federal election, Johnson became the first American president to visit Australia. Holt returned again to the United States in June 1967. The disappearance of Holt in December 1967 greatly shocked Johnson, who came to Australia for his memorial service. In an address to the Cabinet, Johnson compared the impact of Holt’s death to the assassination of John F. Kennedy. Tony Eggleton, who was press secretary to both Holt and Gorton, recalls Johnson reflecting on his relationship with Holt, after meeting his successor Gorton, saying ‘Tony. It’s just not the same’. 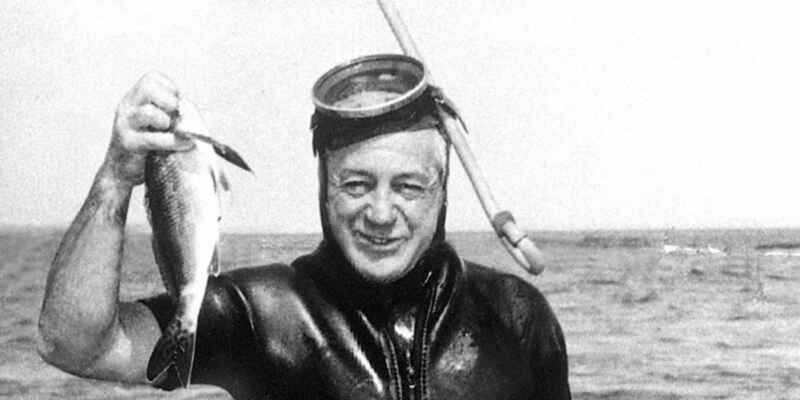 On This Day: a plot to kill Harold Holt?